Believe it or not, we’ve reached the halfway point of the 2018 regular season in fantasy football. What better time to re-do the first round of 2018 fantasy football drafts to see what we’ve learned so far this season? By and large, the fantasy football community was mostly right about which players should be coming off draft boards in the first round this year. The order is a little different, but most of the names look familiar. Gurley’s 16-game pace: 2,320 yards from scrimmage and 29 touchdowns. He’s having a fantasy RB season like we saw in the early 2000s but haven’t seen since. He’s averaging over 20 touches per game and averaging 125 total yards per game with nine scores through six games. Elite. Through six weeks, Barkley leads all running backs in receiving targets (48), receptions (40), and receiving yards (373). Elliott is averaging over 5.0 YPC and has seen increased usage in the passing game as well (28 targets, right there with Gurley’s 26). You probably started 4-0 with Kamara. He lost touchdown potential once Mark Ingram came back, otherwise Kamara would push Gurley for the 1.01 spot. It’s hard to argue against 9 receptions and over 100 yards per game in a Drew Brees-led offense. 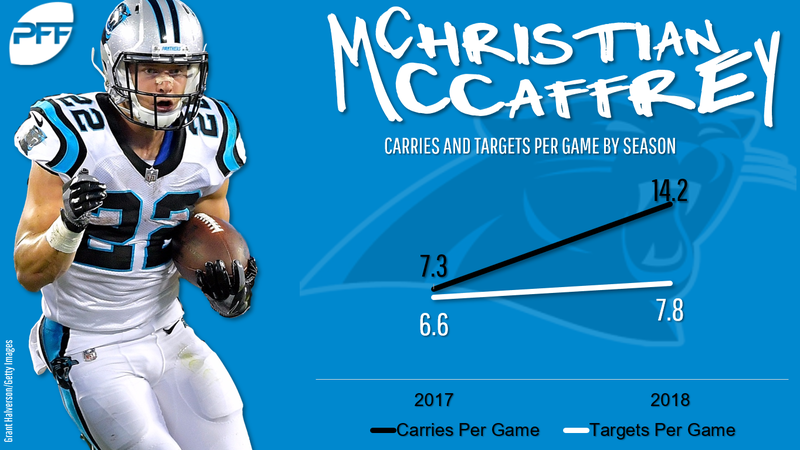 McCaffrey is averaging 21 touches per game, with about seven of those touches serving as high-value receptions. He picked up where he left off last year and he is now averaging over 10 targets and 110 yards per game. An un-Brown-like start still sees him as the WR4 on the year with six scores through six games. Jones is averaging over 10 targets and over 115 yards per game. He hasn’t scored yet, but he’ll experience positive touchdown regression soon. The league-leader in targets (78), receptions (58), and yards (712) through six weeks, Thielen is on a month-and-a-half-long tear that rivals anything we’ve ever seen from a receiver in fantasy. He’s starting to see over 20 touches per game again, and the Cardinals offense is showing more signs of life with Josh Rosen. Johnson does have six scores through six games to keep him as a top-10 RB so far this year.